Afternoon Tea is a wonderful, wonderful thing. Cucumber sandwiches, Smoked salmon with Creme Fraiche and chives, and delicate creamy buns – there’s so much choice, how do you know what recipe to pick?There are plenty classic and traditional recipe choices to go with, as a little research will quickly show. My usual favourites include Macarons, eclairs, and mini fruit tarts, but something creamy with plenty jam is essential. Introducing the Devonshire Split Bun. 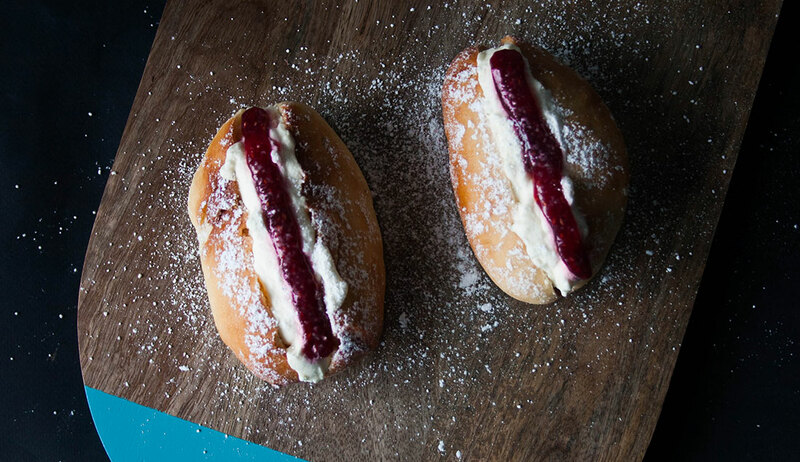 Cream, Jam, and a sweet, soft bun. Afternoon tea at its finest. Devonshire in England is so fond of their afternoon tea that they even have one named after them. The “Devonshire Cream Tea” is an afternoon tea traditionally made up on tea, scones, clotted cream and jam – so you can see how the Devonshire Split Bun would fit very nicely into the mix. 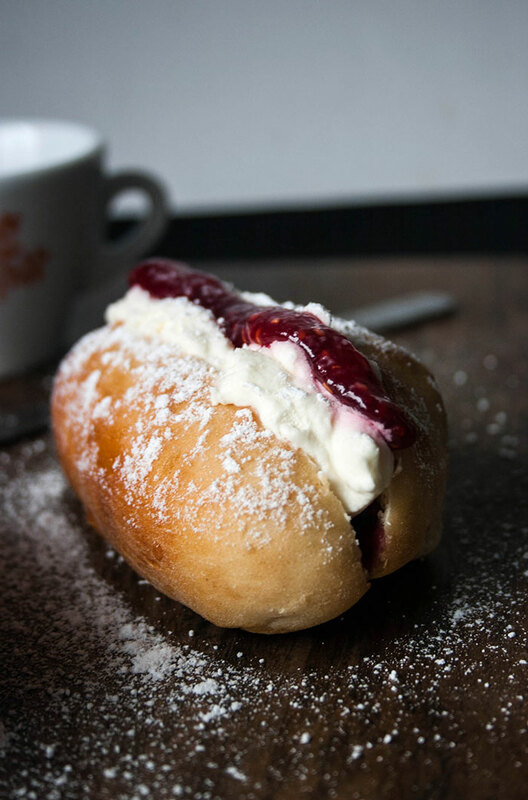 As opposed to a doughnut cream bun or eclair, the bun used here is a soft crust and a delicate crumb, courtesy of a dough made with plain flour, milk, butter, and a little sugar, with an almost bread-like texture. I shaped my rolls into cylinders, although round rolls are the more traditional shape. I’ve never been too worried about shapes. If the flavours there, who cares if it’s round or cylindrical, square or spiral. I certainly don’t! So make whatever shape makes you happy. Just make sure you heap on the cream and jam, with lashings of tea. And I mean lashings. Isn’t that what this recipe is made for? After all, afternoon tea is hardy about skimping on the Earl Grey! The perfect afternoon tea treat. Serve with lots of steaming hot tea! In the bowl of a stand mixer, whisk together the flour and salt. Mix in the yeast and sugar. In a saucepan, heat the milk until 'hand hot' (hot to the touch). Add the butter and stir until melted. Pour the milk into the flour mixture, and mix until a sticky dough forms. Knead (by hand or using a stand mixture) until a stretchy, elastic dough is formed. This should take around 10 minutes by hand, or 5-6 minutes using a stand mixture. The dough may be slightly sticky. Transfer the dough to a lightly oiled bowl. Cover with clingfilm or a damp tea towel and leave in a warm place to rise until doubled in size (around 1 hour). Once the dough is risen, preheat the oven to 200C/390F. Separate the dough into 6-8 equal pieces, depending on the size of bun you want. Shape the pieces of dough into rolls and leave on a lightly floured baking sheet, covered with clingfilm to rest for 10-15 minutes. Bake the rolls for approx. 15 minutes, or until the rolls are golden and have a hollow sound when their undersides are tapped. Once cooled, cut the rolls most of the way through (be careful not to cut entirely through!). Pipe some jam along the bottom, then fill the rest of the way up with whipped cream. Pipe another line of jam along the top, and dust generously with icing sugar. Serve with a large cup of tea. Perfection!